President Timothy J. Flanagan on the Quad. There will be times in the days ahead when Timothy Flanagan checks the campus map before leaving his office for a meeting. As is true of everyone starting their first semester at Illinois State, he may initially mispronounce Schroeder Hall. And it could be awhile before he knows the story of all individuals whose names are emblazoned on the University’s buildings. Ask Flanagan about the significance of Illinois State’s history as a Normal school, however, and there is no hesitation. He readily knows and shares the rich legacy that sets apart higher education institutions established to teach the next generation of teachers. The heritage is just one point of pride the incoming president appreciates about the University he begins leading this month. 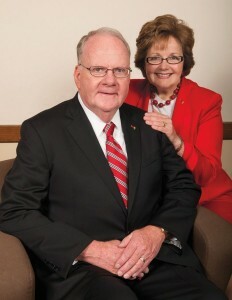 “The Normal school is an important American creation,” said Flanagan, who takes the reigns as ISU’s 18th president after building his career at institutions that began with the purpose of training educators. 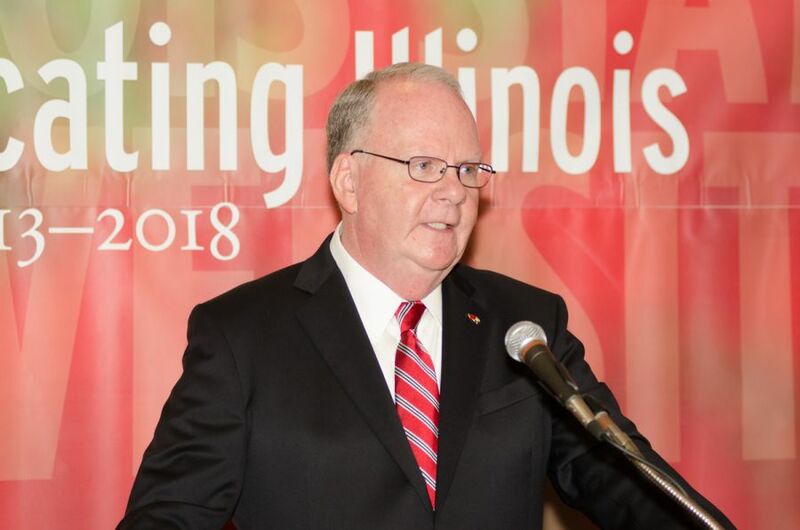 He comes to Illinois State having served the past six years as president of Framingham State University, which was established in Massachusetts by Horace Mann in 1839 as the nation’s first public teacher preparation school. Timothy Flanagan at his introductory press conference in May 2013. “My first task is to keep the momentum going. We will move forward in ways that foster the pride of alumni and strengthen the University’s reputation because that translates into opportunities for graduates,” Flanagan said. 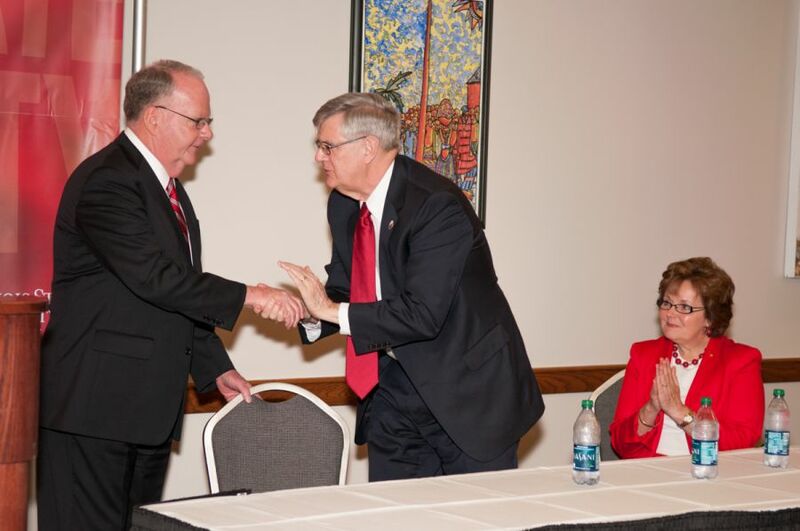 What that means for Illinois State will become clear to Flanagan as he builds partnerships with the campus and community, which he emphasizes will be his mode of operation. “One thing I have learned through the years is that a president acting alone can accomplish very little,” he said. He knows the struggles all too well from having devoted his professional life to higher education as a professor in criminology and sociology, and as an administrator. On track as an undergraduate to become a probation officer, Flanagan was encouraged by a faculty member to pursue graduate school. With a master’s completed in 1974, his goal was to enter the emerging field of criminal justice planning. He instead joined the faculty at Marshall University in West Virginia. It was there Flanagan embraced his first opportunity to build an academic program, as he was one of three in a newly created criminal justice department. He realized the need for the doctorate to continue in higher education, which led him to complete a Ph.D. in criminal justice at the University at Albany, State University of New York. His graduate work focused on prisons as organizations. “I was interested in human adaptation under extreme circumstances,” he said. As a dissertation topic, he chose to study behavioral and psychosocial adjustment of people incarcerated for long terms in maximum security prisons. The research gave him significant insight into human adaptation within complicated organizational structures. Timothy Flanagan, left, is greeted by Board of Trustees chair Michael McCuskey at his introductory press conference in May 2013. Flanagan’s wife, Nancy, is seated at right. “Universities and prisons are fundamentally different organizations, especially in terms of core values, daily activities of residents, and staff and outcomes,” Flanagan said. Yet there are similar challenges as organizations with multiple constituencies, diverse goals, and reliance on inadequate government funding to fulfill a mission so critical to society overall. “All of higher education is confronting the challenge of disinvestment. Taxpayers are not supporting education as generously as in the past, and the balance is being foisted upon students and their families. Our number one challenge is to maintain excellence while remaining affordable and accessible without burdening students with mountains of debt,” Flanagan said, emphasizing the need to increase private funding. He refers to the recession as a mixed blessing for public higher education. Financial worries for families have increased, but public universities are in the spotlight as a more affordable option. “This creates an opportunity to talk about cost, quality and value” Flanagan said. “It is not difficult to make a convincing argument that completing a university degree is still a solid financial and personal investment. He is eager to hear their stories directly. Meeting alums is just one bullet point on his plan of action to immediately engage while still settling into Hovey Hall. He asked the University leadership for a list of 100 people he should meet right away, which reflects his commitment to engage in ongoing conversation with campus and community constituencies. He pledges to openly share key information about the University, including financial and enrollment statistics, as one means of maintaining a consistent dialogue. Flanagan will also keep a finger on the student pulse, getting out across campus regularly for purposeful interaction and taking his administrative team for conversation in the residence halls to assess the ISU collegiate experience. The effort began with move-in, as Flanagan introduced himself to students and shared his understanding of the anxiety tied to being the new person on campus. “I feel exactly the same way as the freshmen unpacking in a brand new place,” Flanagan said. He has a key advantage over the traditional freshman, however, as he is sharing his ISU experience with his “best friend and the love of my life,” his wife Nancy. They met as undergraduates, illustrating a point he shares with current students. 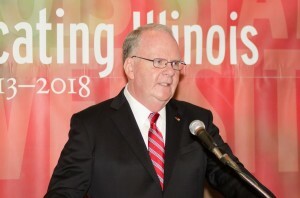 “One of the best parts of a great undergraduate experience is the people that you meet,” Flanagan said, adding that he is eager to begin “an energizing learning experience” at Illinois State. He is ready and proud to be a Redbird. Timothy Flanagan his wife, Nancy, who holds a Ph.D. in nursing. the parents of two adult children and enjoy four grandchildren, all under the age of 5. Their daughter, Erin Coglianese, M.D., is a cardiologist on the heart transplant team at Loyola University Medical Center outside Chicago. Their son, Kevin, is a software architect working for Comcast in Denver, Colorado. The presidential couple also includes Maggie, a 5-year-old golden retriever, as part of the family. Expect to see them walking her on campus and be ready to engage in conversation, as the president and first lady are eager to meet the ISU community. A respected social scientist whose research has focused on crime and justice, Flanagan has presented internationally and written extensively. He has published three books, 40 peer reviewed works in scholarly journals across the fields of criminology, political science and law, and numerous government reports. You can also download President Flanagan’s complete vita.